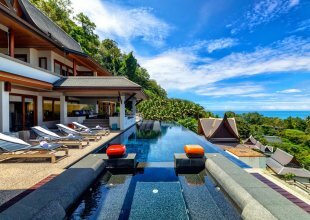 Situated on the scenic east coast of Cape Yamu, Phuket, this luxury villa boasts a beautiful westerly panoramic view of the ocean and its surrounding foothills to soothe your senses. Here you can witness a dramatic atmosphere with its magnificent view of the sunset vanishing behind the sculpted mountains of Phuket. Villa Kalipay is well elevated and perfectly positioned to maintain it’s privacy and an uninterrupted sight of the scenery and landscape overlooking the luxurious villa. From the main entrance, to the living room, dining, infinity pool, and each bedrooms, you will be welcomed by the panorama of the turquoise blue waters of the Andaman Sea and Phuket Bay, along with the outstanding view of two islands, namely Koh Rang Yai and Koh Maprao. The villa offers a luxurious common area that is certainly bound to appeal the likes of fine travellers who have a special taste for lavishness. The villa is equipped with a state-of-the-art surround SONO system where you can play any music of your choice anywhere in the villa. 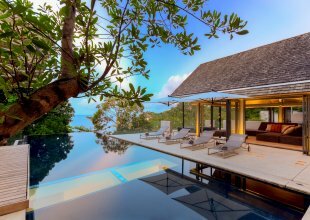 The villa is encased with glass doors and windows from ceiling to floor, and ensures its guests a crystal-clear panoramic view of the outdoor. The dining experience is certainly noteworthy, having 3 options (indoor dining, outdoor dining by the pool, and in the kitchen) all with stunning view point. 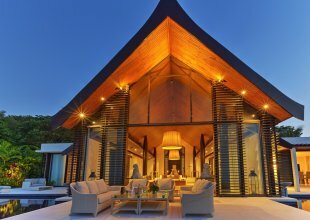 The boutique style interiors of the villa is perfect for families and small private gatherings, and retreats. It houses hand crafted furniture and contemporary art from different countries such as Nepal, Philippines, Thailand, and more, making your experience nothing short of transformational. Rates are per week and based on exclusive use of the property in all 5 bedrooms. Rates for 3 and 4 bedroom usage available outside of peak season.